Floating markets are very popular with travelers in Thailand. 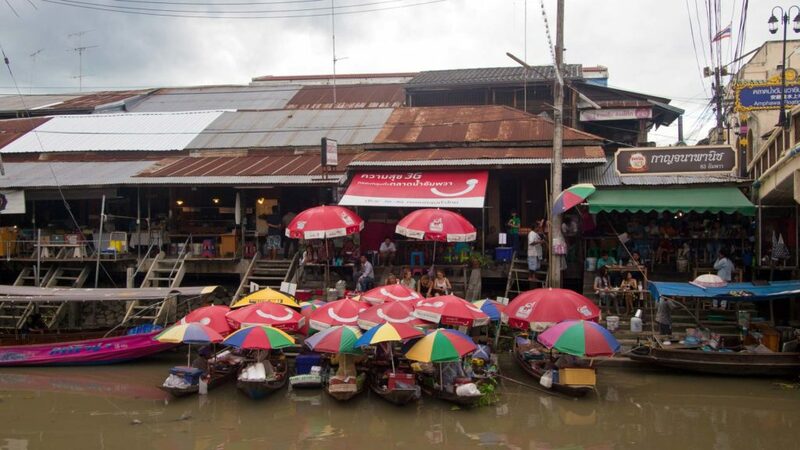 The Amphawa Floating Market is, in contradiction to the famous Damnoen Saduak Floating Market, the most popular floating market in Thailand and not yet overrun by tourists. There are also many local visitors. The Amphawa Floating Market is located approximately 50 kilometers southeast of Bangkok and takes place on a small canal of the Mae Khlong River. It opens every weekend from 12.00 a.m. to 8.00 p.m. So you don’t need to get up early to visit this market. It’s best if you arrive around 3.00 p.m., then the market is still quite empty and you can stroll along the canal. If you expect to drive through the Amphawa Floating Market by boat between all the vendors to buy goods, I unfortunately have to disappoint you. That’s generally not the case at the most floating markets in Thailand. 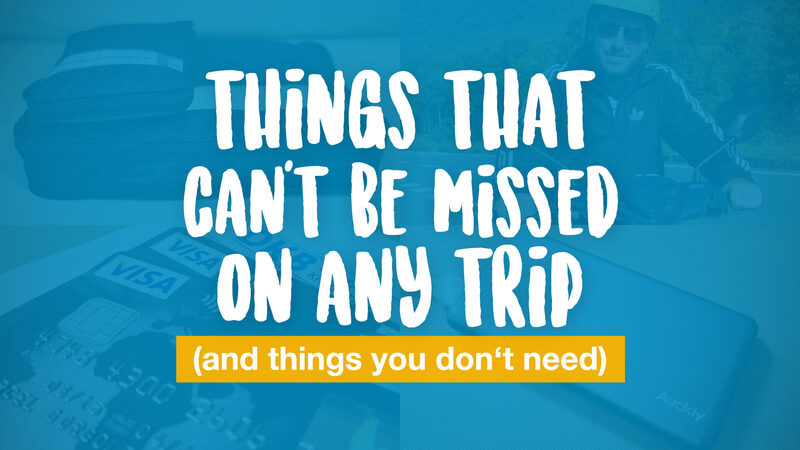 Except for the Damnoen Saduak Floating Market, which is the reason why that market is an attraction among tourists and therefore completely overrun. While there are some vendors on small wooden boats that cook and sell their foods (especially a lot of delicious seafood) to visitors, you will have to eat on small wooden tables in front of those boats. There are also much less vendors on boats than I expected. That makes the market not necessarily bad, but you shouldn’t visit the market with the wrong expectations. The most stalls are along the canal and you can stroll along those. Take a coffee break, eat a snack and enjoy the atmosphere. I think the market is definitely worth a visit. 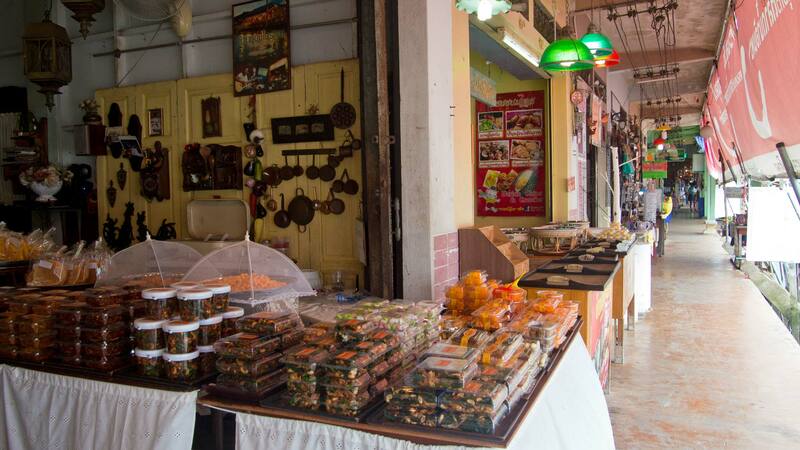 You can easily walk around the market for 2 or 3 hours and see everything calmly. In addition to food, souvenirs, spices and clothes, there is a small temple in the surroundings which is a nice place to visit, too. 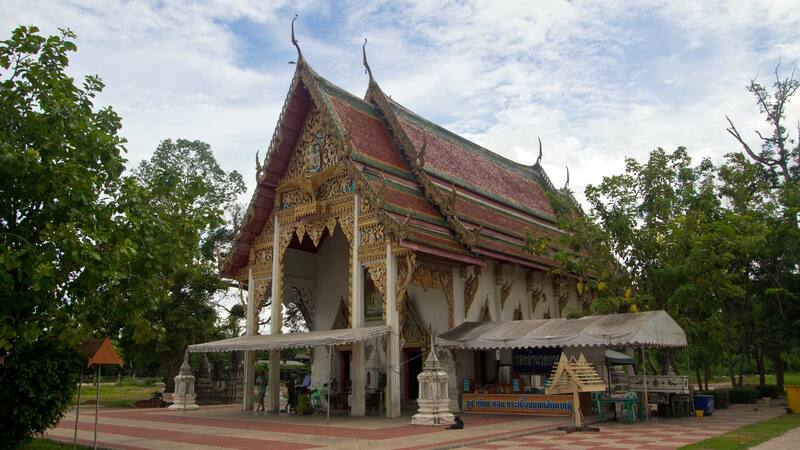 The Wat Amphawan Chetiyaram is popular among Thais. 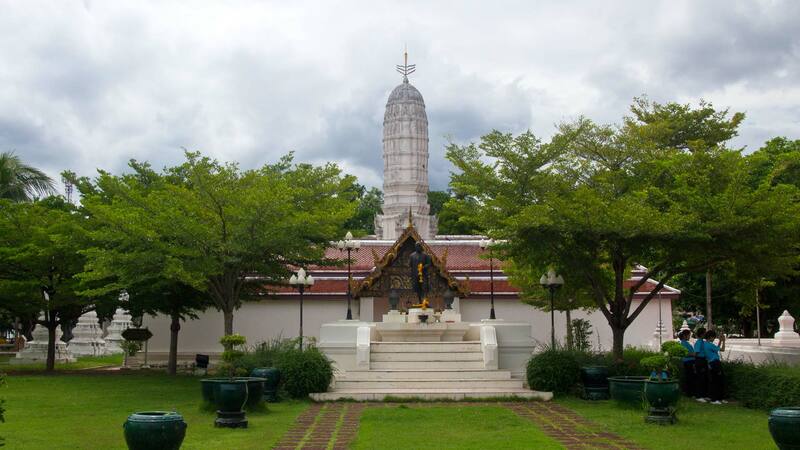 It is believed that the king Rama II was born here. There are some boat tours offered as well at the Amphawa Floating Market that will lead you through the small canals and the Mae Khlong River. 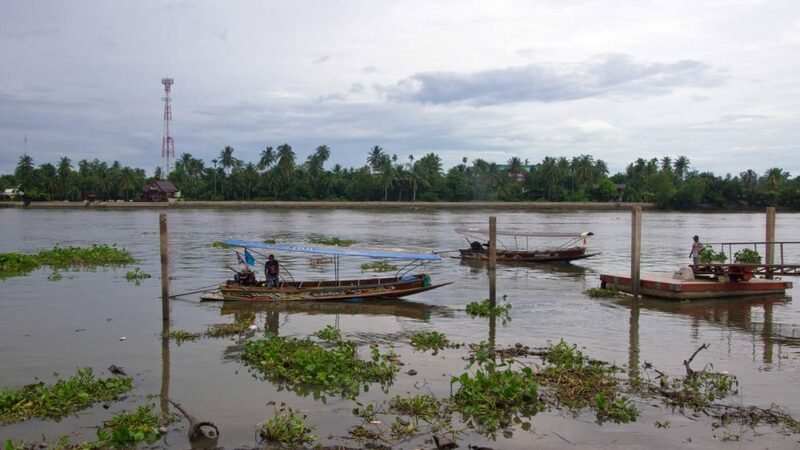 A private tour starts at 500 baht, but if you join a boat tour with some other guests it will be only 50 baht. So just a little bit more than 1 euro. A tour takes approximately 1 hour and will take you along the market and to some temples at the river. The boat has space for about 10 people, so it shouldn’t be too crowded. 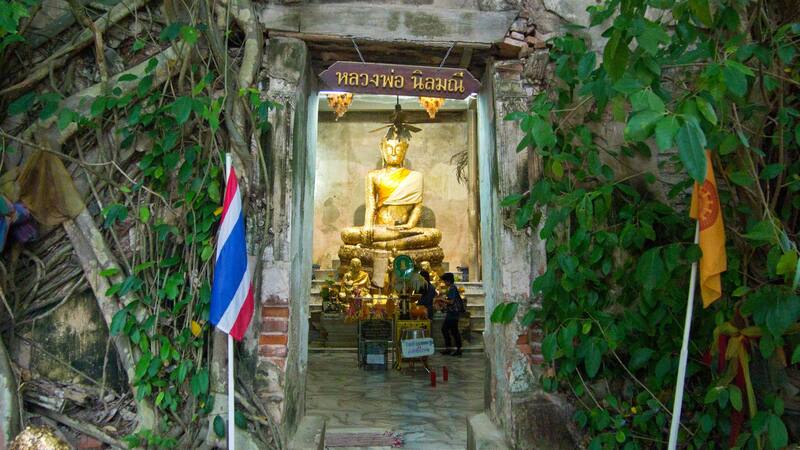 You will get to the most interesting temple at the end, the Wat Bang Kung. There is a small zoo with camels and some other animals, but I don’t know if I like that at all. Across the street is the actual temple, which is quite more impressive. 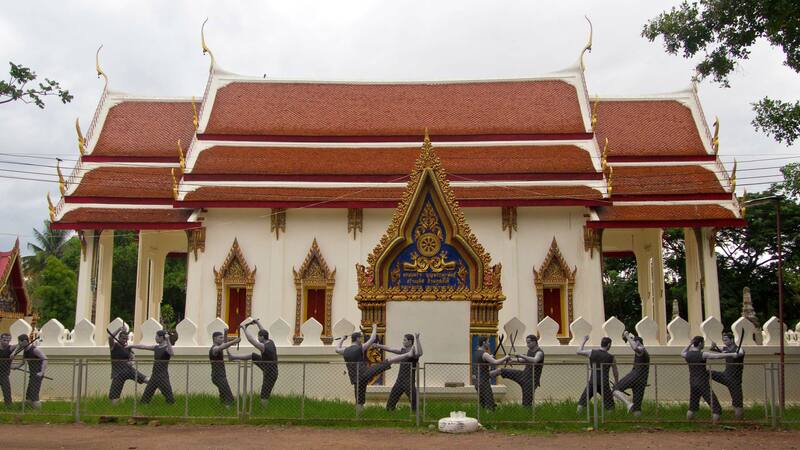 There you’ll find plenty of statues of fighters in front of a building and a small temple that has grown into a tree. It reminds me a bit of Tomb Raider or Indiana Jones. 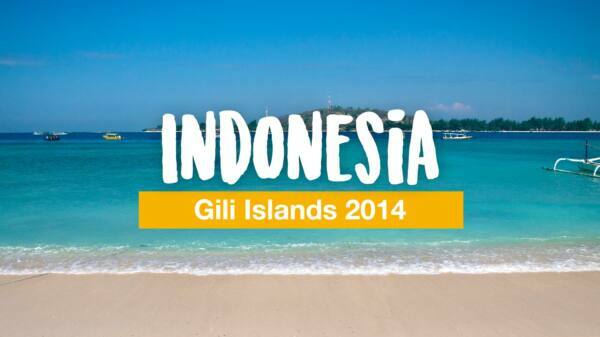 Unfortunately, you will meet here many people from some group tours and it can be a little bit more crowded. After that you will go back to the Amphawa Floating Market and for only 50 baht I can recommend that tour to everyone who is visiting the market. Most of the visitors come from Bangkok by taxi, minivan or with a booked tour. 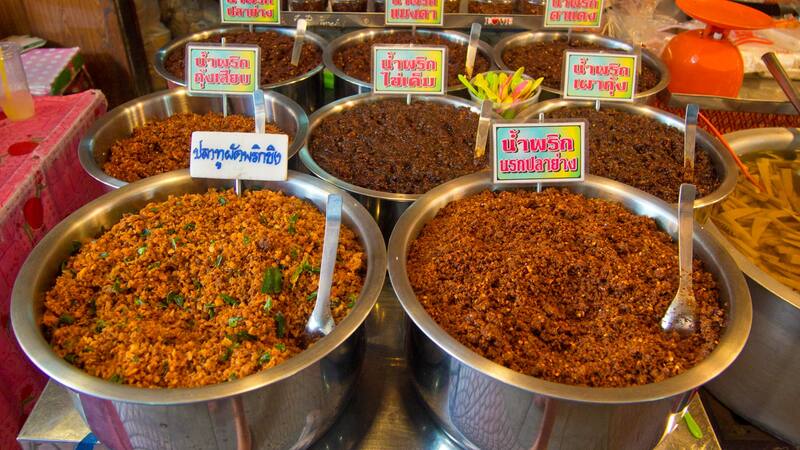 The cheapest would be the minivan which starts from the Victory Monument to Amphawa for about 80 baht per person. The price for a tour is mostly starting at 500 baht per person. You can also do it less stressful like I did it. 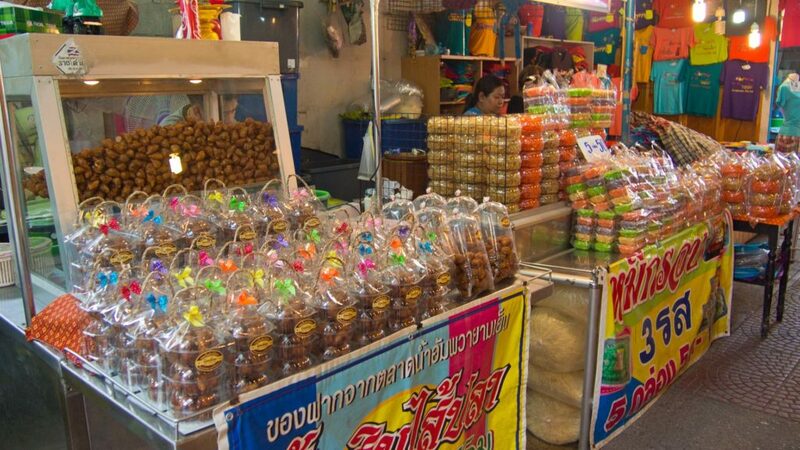 I stayed overnight in Samut Songkhram to visit the market. You can even combine the stay with a visit at the Maekhlong Railway Market. Unfortunately, there wasn’t a train coming through the market during my stay since there were going on some constructions on the railway. I can recommend you to stay at the My Garden Serviced Apartment. The rooms are all very clean and the building looks pretty new. There is free wifi, free water, a refrigerator, balcony and TV. You can also find some small restaurants and a Tesco Lotus with a food park in the vicinity where you can grab some food easily. 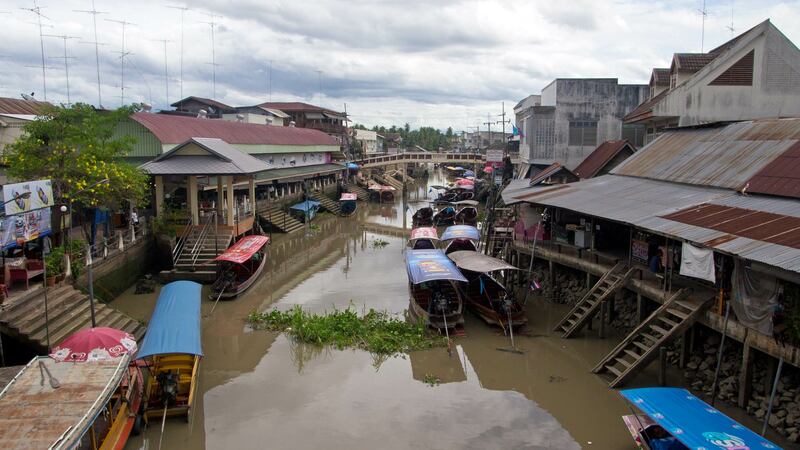 Have you been to the Amphawa Floating Market? Or at another Floating Market? Did you like it? Leave us a comment below! May I know how to get the boat tour that you mentioned 50baht/way? 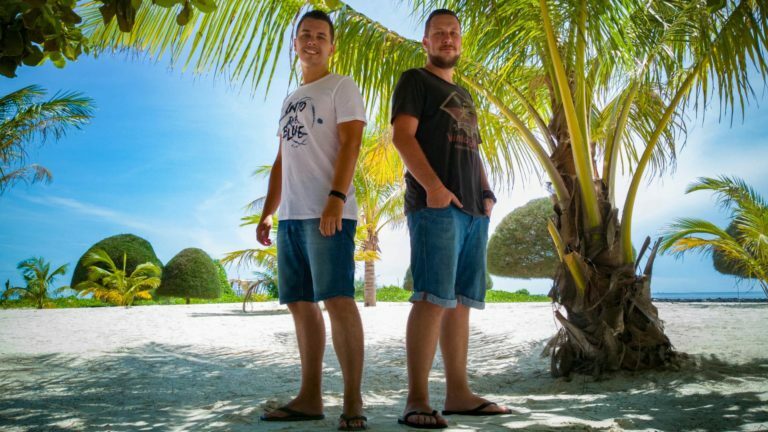 Is there any specific counter for boat tour? no there’s not really a counter. If you walk through the market along the canal you will see the boats, can’t really miss them. Some guys are standing outside and selling the trip for 50 Baht. The market is quite small though. I would like to know the time for firefly, do u know it? 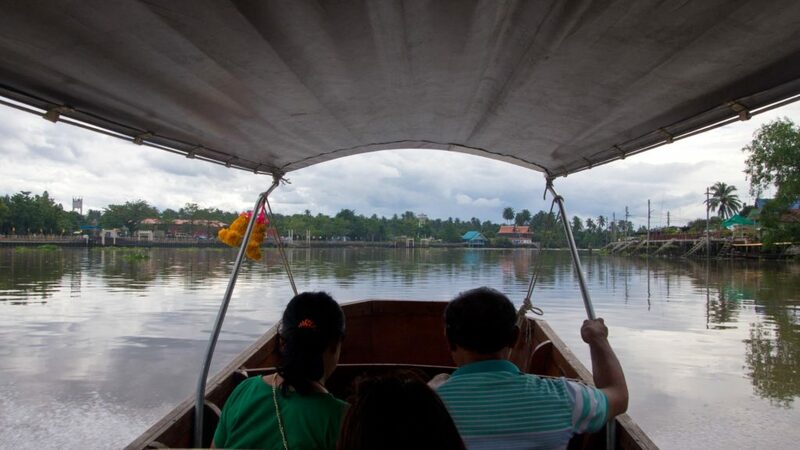 if i only have day trip in amphawa floating market, i still can rent a boat the see the firefly? Will i miss the last mini van due to this? they usually start in the evening, so I guess maybe between 6 and 7 P.M. since it’s getting almost every day dark at 6.30 P.M. in Thailand. I’ve seen the tours but I never did them. I’m not sure if you can do it during a one day trip, probably with an organized tour from Bangkok, but on your own I don’t know if you can catch a late minibus from there. If you got some more times I would suggest to stay in night in Mae Khlong and visit the railway market too and the Amphawa Floating Market in the evening. I found the timetable for the train here: https://www.tielandtothailand.com/famous-maeklong-railway-market/ Maybe that helps you. 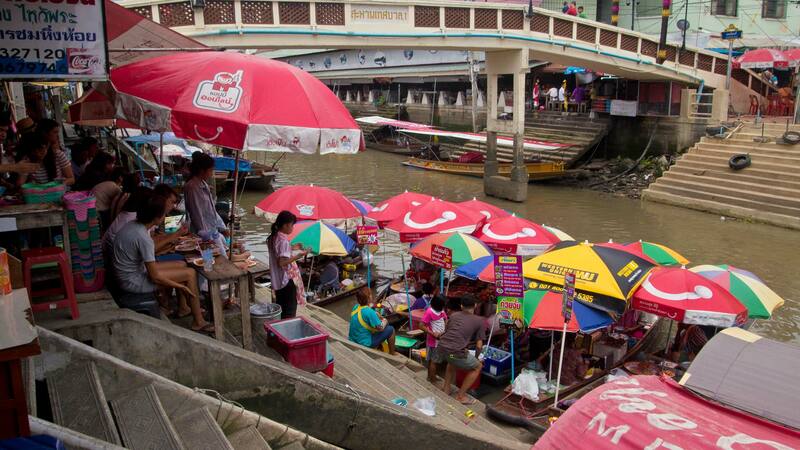 The Maeklong Rail Market is open everyday and the Amphawa Floating Market Friday to Sunday. Nice! 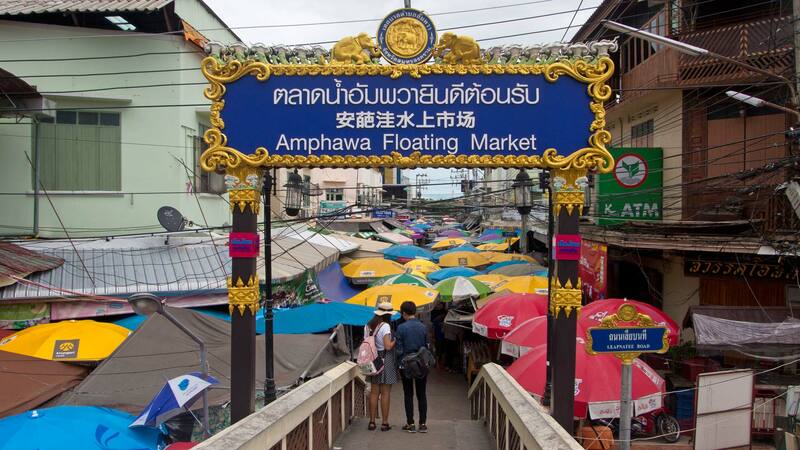 I’m planning my visit to Thailand (nov) and I also want to go to Amphawa floating market. I didn’t know you can make a boat tour at the market but now it’s on my todo list! I also hope I can combine it with the famous railway market. Thanks for the inspiration! Hi Judith, the famous railway market was closed or better said the train tracks were under maintenance during my visit, so there was no train. But I just read that the construction is finished by now and the train is going through the market as usual. Enjoy your time!